There's not much happening on the knitting/crochet front this week as we're busy with holiday preparations and daily swimming lessons for the lad. And a miracle - after three years of being absolutely terrified of the water, and hence us hardly ever venturing to a pool, Little Miss suddenly decided that she wants to go swimming today too. She's funny like that - so totally determined not to do something, and then when she decides to do it - in her own time - just gets on with it without a fuss. Should be an interesting afternoon. 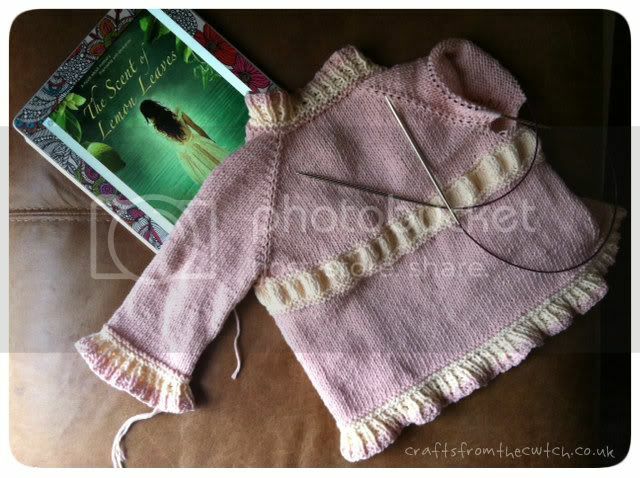 The upshot of this is that not much has changed since Sunday's post, except that Saffron is almost finished, just the last sleeve to knit. Here's the back - I'll save the front ruffle shot for Friday. I've enjoyed making this for her so much that I've just bought some yarn to make something else. Yes, I am destashing, but this is some VERY bright colourful Marble DK (nothing like it in my stash) that she chose in the Deramores sale and I think it'll be a perfect antidote to yet more overcast and gloomy skies, which you can see from the picture taken this morning. After finishing The Earth Hums in B Flat (which I enjoyed) last week, I've downloaded plenty of new books from the Kindle Reading Marathon. I've picked up some bargains and some unknown books I thought would be worth a try for less than £1. Last night I started The Scent of Lemon Leaves. The book is told from the perspectives of Juliàn an elderly man with a terminal illness and Sandra, a pregnant single woman at a crossroads in her life. Their paths look set to cross via an elderly Norwegian couple who Juliàn has been led to believe may be former Nazis from his days in a concentration camp. The blurb tell me it's a tale of redemption, self-discovery and exploration and so far I like it. Looking forward to seeing the other WIPs and books when the links are up at Tami's and Ginny's. I'm a lot like Little Miss in my decision making process, too. Your knitting looks so neat and tidy for a WIP! I adore your Saffron, beautiful colours and knit. Thanks Jacinta, I don't think it'll fit her for long actually, but it's a lovely pattern. Yay for Little Miss! Your sweater is beautiful - the colors remind me of ice cream. Good luck with the swimming then :-) Your sweater looks great - and very yummy indeed, like and ice cream! Thanks Paula, she liked it in the pool and didn't want to get out! That is an adorable sweater. I love the colors. It's a great pattern - I have lots more in my queue from the same designer now - it's well written and easy to follow. The little sweater is darling! Can't wait for Friday! That is such a lovely sweater!! I think it's turned out really nicely considering it was made from very inexpensive yarn! I love the girliness of your Saffron. Reminds me of the antebellum period. My girls love swimming too :O). It's such a great life skill yeah? You are one of the ppl who inspired me to read again. That's very interesting - I don't know much about American architecture, I shall look it up. I am sooooo jealous you get to knit. I am suffering from crochet fatigue!! I love knitting and crocheting for children. I really must get a Kindle, it would fit in my crochet bag just perfect. Hmm.. wonder if I could sell it to DH that way? Glad your little miss enjoyed her swimming. I took my little man swimming the other day and he squealed for nearly an hour straight (he's 13 months). Thanks for the heads up on the kindle marathon- somehow had passed me by. I have stocked up! It does go to show that we should sometimes step back and let children do things in their own time! Not that easy always. The Saffron looks gorgeous in those colours - Lucky little Miss. The reading sounds interesting, I love it when the author manages to make appropriate connections between characters of different generations.